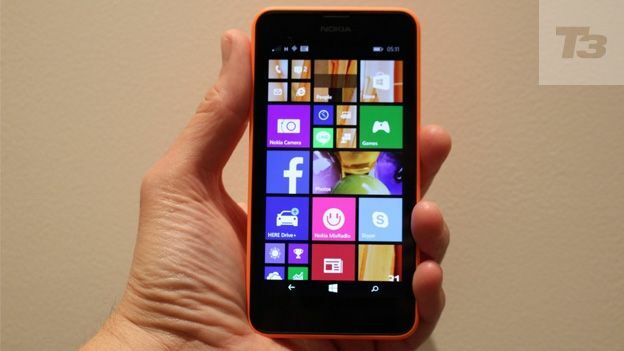 Is the eye-catching Nokia Lumia 630 a worthy budget Android challenger? With a bunch of highly affordable smartphones hitting the market, from the Motorola Moto E to the Huawei Ascend P7, Nokia, newly owned by Microsoft, has a lot of competition in the budget market. So its new Nokia Lumia 630 - attractive, capable and packed with useful apps - isn't going to have an easy ride. This is a Windows Phone handset, with the advantages and restrictions that apply: an operating system that is elegant and potent but has yet to capture the public's affection in the way Android and iOS have. And although there are now over 250,000 apps for the platform (which MUST be enough, right?) it's still a long way off the million its bigger rivals boast. Mind you, some apps like the excellent recent Flickpic which shares photos and more with the flick of a wrist and without wi-fi or pairing between phones, are appealing and enjoyable. What's more, this is the first phone to sport the latest edition of the operating software: Windows Phone 8.1. The Nokia Lumia 630 comes in a choice of matte-finish colours which look great. Nokia has a history of making polycarbonate-cased phones look good, from its first Windows phone, the Nokia Lumia 700. HTC and more recently Apple are the only other manufacturers with such skills in plastic. There are bright green and orange finishes to choose from as well as a more demure black. The next phone, the Nokia Lumia 635 offers 4G, which this does not, and will be distinguished from this by having gloss instead of matte cases. This is not a unibody phone. The coloured back pops off easily so you can insert a sim card and - hooray - a microSD memory card. It feels light enough (it weighs 134g) and the curved shell fits the hand comfortably. The overall measurements are 129.5 x 66.7 x 9.2mm.Though it lacks the opulence of a sealed phone like the HTC One M8, it's an attractive handset. The phone doesn't have the high-spec features of a premium handset - there's no heart rate monitor as there is on the Samsung Galaxy S5 and it's not waterproof like the Sony Xperia Z2. But it has the latest Windows Phone OS, which has some neat additions. You can now have extra live tiles - the dynamic elements which update information on the fly and can be resized up to the width of the screen. Or you can now fit up to six across the display. When you have that many, the information displayed is minimal, just enough to identify whether it's email or camera, for instance. At larger sizes this also reveals how many mails are unread, say. Visually one of the disappointments of Windows Phone has been the fact that it wasn't possible to have wallpaper behind the tiles. Windows Phone 8.1 solves this imaginatively: you can now pick a picture or pattern and the tiles themselves become transparent, so the background shows through. Not all tiles blend like this, but it's a cool effect. The latest software also includes Cortana, Microsoft's voice-activated personal assistant, though this is not activated in UK phones yet. And it includes a new swipe-gesture keyboard, similar to that seen on Swype and Swiftkey apps on Android. The speed and accuracy of this are astonishing, and it looks great, thanks to the tail of colour that follows your finger, matching the colour of the phone OS theme - configurable by you. This 4.5-inch screen is no Retina display - no surprise given the phone's price. It's not bad, though, even though at 480 x 854 pixels it's a 218ppi resolution. But it has one great feature: it's a CBD phone. Clear Black Display, that is, and it's Nokiaís term for a screen that is optimised to be easily readable even in direct sunlight. Like most smartphone screens now, there are no capacitive buttons under the display. Previous Lumias had Back, Start and Search keys below the screen but now these are incorporated into the main display. The camera on board the 630 is a 5-megapixel model. Not bad, given the budget price, but there's no flash, so low light situations are challenging. Now, flash often ruins a photo so maybe it's not such a bad thing after all. Nokia is skilled at making the most of smartphone pictures and the effects and menus here are pretty good - a semi-professional mode means you can adjust brightness, white balance, ISO and more. Too complicated? Switch to auto and let the phone do the work. Results are good, though no match for the Nokia Lumia 1020 with its 41-megapixels. Video recording is decent enough but again not exceptional. Windows Phone on the whole seems to be quite parsimonious in the demands it makes on a handset's processor, and certainly the 630 moves fast enough. And that's using the latest Windows Phone 8.1 software. The chip is a Qualcomm Snapdragon 400 Quad-core 1.2 GHz Cortex-A7 model and it does everything the system needs it to. No problem using the swish and swift Microsoft OS here. Nokia says the Lumia 630 lasts 600 hours on standby, which seems preposterously long. But it certainly manages a few days if you don't use it much. And if you do, there's pretty decent battery life here. It easily lasts into a second day, though you may worry that it won't last until the end of it. So, as ever, nightly charges are favourite. Nokia has skill at making affordable and attractive handsets - the Nokia Lumia 530 was a popular choice and is one of the most purchased Windows Phone handsets ever. This is a worthy successor with cute styling, okay screen and highly effective processor. It has good battery life. But the standout is the software: Windows Phone 8.1 is great and is only going to get better. And Nokia's specialities in mapping, music and more. The photo software for instance, reveals skilful exploitation of an unexceptional camera to strong effect. This phone is great value and great to use.